At the General Assembly in Vienna, Austria in September 2008, a new prestigious role was created within WorldSkills to recognize people that have done extraordinary things for the promotion of skills throughout the world. This position is an important role within WorldSkills as the WorldSkills Ambassador exemplifies the excellence, pride and passion of skills. WorldSkills Ambassadors will be invited to key events, meetings and activities within WorldSkills to share their experience, knowledge and most importantly their passion for skills. Military pilot and bachelor of science in aeronautical technology from the Brazil Air Force Academy, Pirassununga, Sao Paulo. Advanced jet training at the 2/5 Instruction Aviation Group, Natal, Rio Grande do Norte, assigned to 3/10 Strike Aviation Group, Santa Maria, Rio Grande do Sul. Master of science degree in Systems Engineering from Naval Postgraduate School, Monterey, California. In 1998 Pontes was selected for the NASA class 17 of astronauts. As a military pilot, he was qualified as an instructor and squadron leader for Ground Attack missions. As a Flight Safety Officer, his work experience included 22 years in aeronautical accident prevention and investigation. His experience on Flight Safety includes participation on the Space Shuttle Columbia Accident investigation. As a test pilot he worked on weapons development, missiles, including the first Brazilian air-to-air missile, and several aircraft tests and evaluation. He has logged over 2,000jet and test flight hours in more than 20 different aircraft, including F-15,F-16, F18 and MIG-29. As a Technical Consultant, he works on concept development, systems design, and project management for the aerospace, energy,and transport sectors. Selected as a mission specialist, he reported to the Johnson Space Center in August 1998 to attend Astronaut Training which included orientation briefings and tours,numerous scientific and technical briefings, intensive instruction in Shuttle and International Space Station systems, physiological training and ground school to prepare for T-38 flight training, as well as learning water and wilderness survival techniques. Pontes was initially assigned technical duties in the Astronaut Office Space Station Operations Branch. As an engineer and project manager, Pontes has worked in several space related projects, including the International Space Station Japanese Experimental Module, the centrifuge accommodation module, Brazilian flight support equipment development, etc. 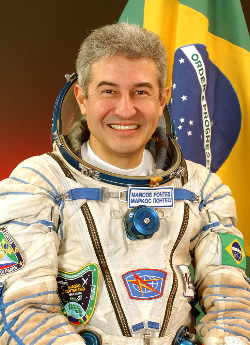 Pontes is the first professional Brazilian astronaut to go into space. He launched with the Expedition-13 crew from the Baikonur Cosmodrome in Kazakhstan on March 29, 2006 aboard a Soyuz TMA spacecraft, docking with the station on March 31, 2006, where he lived and worked for the next 8-days. Pontes returned to Earth with the Expedition-12 crew landing in the steppes of Kazakhstan in their Soyuz spacecraft on April 8, 2006. He continues on stand-by, as an astronaut for future Brazilian space flights. 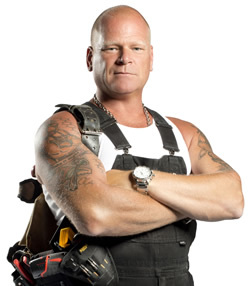 Mike Holmes is known as Canada's Most Trusted Contractor and is considered Forbes' Third Most Trustworthy Celebrity. When Mike was very young his father passed onto him a simple code, which continues to push him to do what he does best: Make It Right®. Mike has accumulated over 30 years experience as a professional licensed contractor, completing nearly 200 home renovations and remodeling disaster projects and 52 home inspections throughout his television career. His award-winning series and specials are seen in over 83 countries worldwide and he is considered the Second Most Trusted Canadian by Reader's Digest. 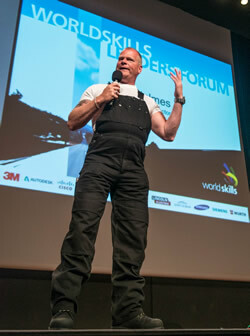 Mike Holmes' formal certification includes a General Contractor License, including Liability and Workers' Compensation Insurance, an Honorary Doctorate of Technology from the British Columbia Institute of Technology (BCIT) and an Honorary Doctorate in Pedagogy from the University of Niagara. Mike started his career in television over ten years ago as co-creator and host of one of the most popular television programs in HGTV history, Holmes on Homes®, which was the #1 show on HGTV Canada since the summer of 2004. Since then he has been able to use television as a tool to educate homeowners on proper building code, what to look for in contractors and their rights as homeowners. Mike has spawned a number of thriving projects related to his area of expertise, including television and media production, product and service development, as well as publishing. Mike has also successfully launched Holmes Approved Products program, which incorporates partnerships with industry leaders, such as 3M and Eaton. As a craftsman with integrity, Mike not only understands the practices of the building trade but is also dedicated to adapting them to the changing needs of homeowners and the environment. His tireless dedication to improving building standards and sustainable construction has been recognized by both the Canadian government and building industry. He has been officially acknowledged by the Canadian House of Commons for his promotion of skilled trades and advocacy for improved building standards. Mike Holmes has consistently proved his expertise, technique and skill when it comes to building, but it's his passion and integrity to Make It Right® that has struck a chord with homeowners and industry leaders alike. It's this kind of passion which people seek for various industry events, prompting him to become the national spokesperson for Skills Canada, WorldSkills Ambassador, honorary guest speaker for the 2009 GreenBuild conference and 'Eminent Advisor to the Canadian Government' for the COP15 in Copenhagen (United Nations' conference on climate change). Mike's mission is to improve the building industry from the ground up and raise building standards across the board. He believes that educating the public at large on the importance of upholding building code and construction principles is essential to preserving and enhancing the safety and well-being of communities and households, both at home and abroad. Mike believes that educating the public at large on the importance of upholding building code and construction principles is essential to preserving and enhancing the safety and well-being of communities and households, both at home and abroad. For this reason he continues to work in television today through his new series, Holmes Makes It Right. A series about contractor rip-offs and how to avoid them. Homeowners around the world learn from Mike's tips on how to manage a renovation and what to look out for when it comes to home repair and maintenance. A two-part special where Mike helps a desperate couple after a contractor put a lien on their home. Mike tears down their house, brick by brick to build them an entirely new home using sustainable building techniques. A gripping re-telling of a project where Mike and his crew travel to New Orleans to build a sustainable, hurricane-resistant house for a victim of Hurricane Katrina. A series that highlights the problems homeowners face when a home inspection doesn't do what it's supposed to – protect the homeowners. A series where Mike helps homeowners and communities in hopeless situations by giving everything he's got to make it right. July 4, 2013. WorldSkills Ambassador. Awarded in recognition of his dedication to promoting vocational training throughout the world and sharing his experience, knowledge and passion for the skilled trades. August 16, 2012. Forbes' Third Most Trustworthy Celebrity. Based on data from E-Poll Market Research whose E-Score Celebrity service ranks more than 7,000 celebrities. May 13, 2012. Doctorate of Pedagogy (Honourary), Niagara University. Awarded in recognition of his outstanding work in education. April 27, 2012. Honorary Ambassador. Recognized by the International Code Council Foundation (ICCF) for his efforts in promoting safe building code. April 2011. Second Most Trusted Canadian. Named by Reader's Digest Magazine following a national poll based on magazine readers. October 26, 2010. Honorary Code Leader. Recognized by the International Code Council Foundation (ICCF) for his efforts in promoting safe building code. April 2010. Second Most Trusted Canadian. Named by Reader's Digest Magazine following a national poll based on magazine readers. December 2009, COP15, Copenhagen, Denmark. Attended global summit as an Eminent Advisor to the Canadian Government on sustainable building technology and its effect on climate change. February 18, 2008. Doctorate of Technology (Honourary), British Columbia Institute of Technology. Awarded in recognition of his "outstanding and sustained achievement" as an "extraordinary craftsperson and philanthropist." October 30, 2006. Recognized in the Canadian House of Commons as an "Accomplished Builder with a social conscience" for his promotion of skilled trades, advocacy for improved building standards, support of SOS Children's Villages, contribution to the community through his work and establishing The Holmes Foundation. 2012. Queen's Diamond Jubilee Medal. In recognition of his significant achievements and contributions to the Canadian housing and building industry. 2011. Ontario Electrical Safety Award. In recognition of his work in advancing public electrical safety awareness in the community and home. 2009. Gemini Award for Best Television Series, for Holmes in New Orleans. 2005. Gemini Viewers' Choice Award for favourite TV personality. Mike has successfully published several books, including the international bestseller, Make It Right, which became the No. 1 bestseller in Canada for non-fiction. He also publishes a weekly syndicated national column, Make It Right, which currently has a total circulation of 6,000,000. The Holmes Inspection, The Essential Guide for Every Homeowner, Buyer and Seller. New York, USA: 2012. Make It Right, Expert Advice on Home Renovations. New York, USA: 2011. Make It Right, Attics and Basements. Toronto, Canada: Harper Collins, 2011. Make It Right, Kitchens and Bathroom. Toronto, Canada: Harper Collins, 2010. The Holmes Inspection, Everything You Need to Know Before You Buy or Sell Your Home. Toronto, Canada: Harper Collins, 2008. Make It Right, Inside Home Renovation with Canada's Most Trusted Contractor. Toronto, Canada: Harper Colllins, 2006.